Also, make sure to look at the Question Management portion of the tutorials for such things as deleting questions, adding page breaks to your survey questions, and setting the order of your questions. When you have reviewed, edited and revised all the facets of your questions and ready to go live with your survey, make sure to Activate Your Survey. Upon making your survey Active, a link to your survey will be generated for you to distribute to your users. Click on the Link to Survey URL to open the Survey in a new page. 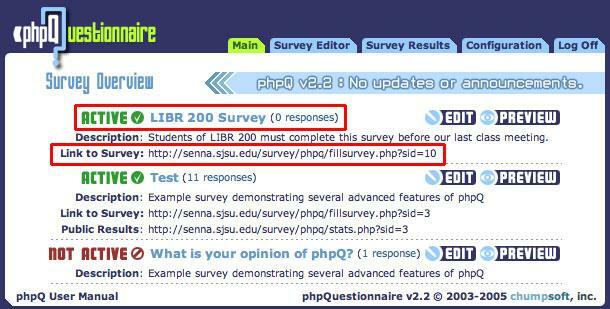 From the new page, copy the Survey’s URL from the address bar and distribute it to your users.